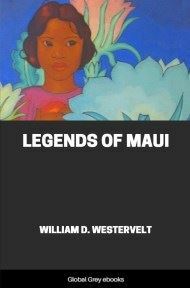 A collection of tales from Hawaii surrounding the legends of volcanoes. 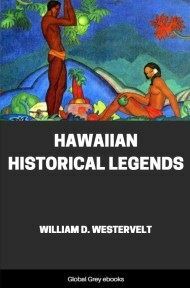 Split into 2 parts, Part 1 deals with the actual legends and includes chapters such as; How Pele Came To Hawaii; The Annihilation Of Keoua's Army; Genealogy Of The Pele Family; Pele And Kama-Puaa; Destruction Of Kamehameha's Fish-Ponds; and, Hiiaka's Battle With Demons. 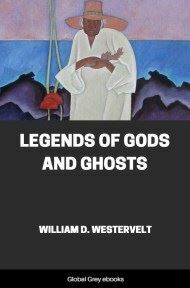 Part 2 has 5 chapters that cover the Geological facts, such as volcanic activity. Of all the noteworthy groups of islands of fire rock in the Pacific Ocean, the Hawaiian Islands are the most stupendous. The crack in the floor of the ocean upon which they are built extends from the large island Hawaii northwesterly about two thousand miles toward Japan. The islands for the first four hundred miles are large and mountainous, but as the chain is followed toward the end; the islands quickly become mere bluffs rising out of the sea, or low coral islands which have been built on the rims of submerged volcanoes. It is interesting to note that the oldest, the smallest, and the lowest of these islands lie nearest to Japan. One of these--Midway Island--is used as the United States mid-Pacific cable station. Properly speaking, the Hawaiian Island group should cover all the islands in this chain two thousand miles long. The mountains of the large islands rise from 3,000 to 14,000 feet above the sea-level. Between this majestic range of island mountains and the "Giants of the Rockies," along the western coast of the United States, lies a rough ocean valley abounding in hills and deep ravines with an average depth under the sea-surface of about 2,600 fathoms, or 15,600 feet. We know very little about this valley save that its floor is covered with evidences of volcanic action. Pumice and scoriæ appear to be universally distributed on the bottom of the ocean. Red and gray, and blue and green clays abound. The disintegration of pumice is given as the chief source for the formation of this clayey matter. Sometimes the deposits are permeated with meteoric or star dust. As the ocean depths draw near the island coasts, they grow more and more shallow and become a wonderful fairy-land into which the dreamer looks from his floating canoe. Strange branching thickets of coral lie below, sometimes fringed with moving seaweeds and exquisitely colored sea-mosses, while through the coral and moss swim the marvellously painted fish of a hundred varieties. Turning and twisting in and out of coral caves are the spotted eels or the great pink or brown anemone-headed sea-worms. Sea-urchins and star-fish crawl lazily along the valleys and the uplands of the coral reef. The surface of the sea is itself covered with ceaselessly moving waves reflecting a tropical luxuriance Of color. From well-known localities hundreds of fishermen gather spoil for the sustenance of life for themselves and their friends. Wonderfully restful is the dream life of the winterless seas of the coral caves, and yet even to-day fierce floods of boiling lava sometimes find their way over the seashore and down over the reefs, destroying the life of sea-moss and coral polyps, and surrounding shells and fish and crawling slugs or swift-moving eels with floods of turbid, boiling, death-dealing water in place of the clear waves through which they had been accustomed to journey. Each island has its individual extinct craters, but no island has any form of hot geyser action such as characterizes the Yellowstone Park of the United States, or the region around Rotorua, New Zealand. The nearest approach to a geyser deposit such as abounds in central Mexico is found on Molokai and around the small crater Leahi (Diamond Head), near Honolulu. Leahi was evidently forced up through coral reefs and the mighty heat produced small layers of geyser-like deposits. The islands have been built up by lava alone. This lava rapidly falls to pieces under the influence of sunlight and rain, thus permitting plants, such as giant ferns, small shrubs and grasses, to take root. These plants break up the fire-rock very rapidly and send seeds broadcast to multiply soil-making activities. Thus a lava flow in a few years becomes the foundation for a growing forest. 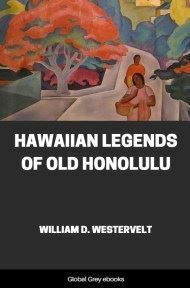 The fire-rock, breaking through the floor of the ocean to form the Hawaiian chain of islands, lost its power first in the far northwest and cooled and hardened from island to island until it is now making its last appearance on the largest and most southeasterly of all the group, the island known by the name Hawaii. Here is still to be found what is called the largest active crater in the world, Kilauea, and the sister crater, Mokuaweoweo, from which come the most voluminous lava flows, the latest one being in May, 1916. Kilauea is about 4,000 feet altitude, while Mokuaweoweo is nearly 10,000 feet higher and is on the summit of Mauna Loa. Professor Jaggar, the experienced volcanologist in charge of an observing station on the brink of Kilauea, accepts the theory of a gas connection between these two craters so that their activity is mutual as to foam vents, but not so close that the lower volcano affords a hydrostatic outlet to the lava in the higher crater. In this place it is well to note a fact which makes the scientific study of the active fire-lake of living volcanoes a very valuable index of coming events. Professor Jaggar says: "It has long been known that the crust of our rocky globe rises and falls with a tide similar to that of the ocean. From direct experiment professors of Chicago University have recently proved a tidal movement in the solid earth up and down of about a foot twice each day, and varying in amount through the lunar month and the solar year. There is definitely a daily movement marked in the lava level of the fire-pit of Kilauea, and there is a marked semi-annual high level." This scientific study of active craters is still in its infancy and promises, as Professor Jaggar says, "to create a new science in which we may hope at some not distant day to predict the periods of volcanic eruptions and earthquakes."